Wooden Storage Sheds - Who Has The Best Wooden Storage Sheds? Wooden storage sheds are in many ways the archetypal garden building, it’s as if they’ve entered British folklore. 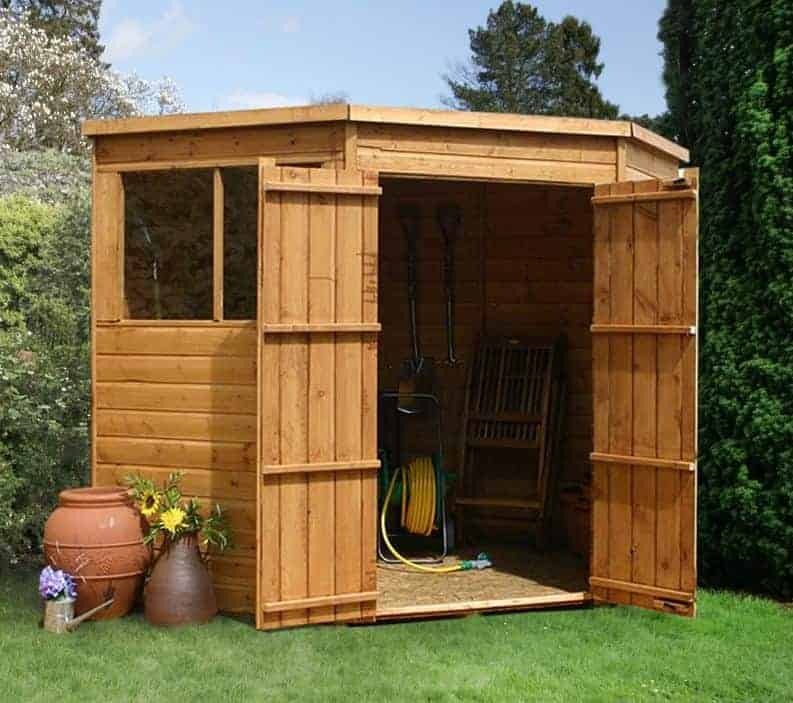 Let’s face it, a garden is incomplete without a wooden storage shed standing proudly within it. 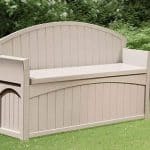 They’re not just a convenient and secure place to store tools and gardening equipment, they can be a focal point for the garden as a whole, and a place to relax. With so many models to choose from, in many different styles and shapes, WhatShed have created this handy guide that reveals the 20 best wooden storage sheds that can be bought online in the UK today. Our first task when compiling this list was to decide what exactly makes a storage shed. We decided upon buildings that had a base area of less than eight feet square, as this excluded log cabins and workshops. We next considered the price of each shed, and the overall value for money they offered. We also looked at the design and appearance of each shed, and took into account any value adding features they may have, such as extended warranties. There are lots of high quality wooden storage sheds on the market, so selecting the top twenty, and then the top one, was no easy task. Congratulations, then, to the Shed Republic ultimate tongue and groove shed. It’s not the cheapest shed in our league table, but it claims top spot by being good looking, tough, secure, and durable. 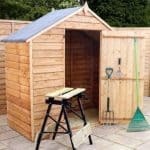 Whether you want a storage shed for your garden, a metal workshop, or a summer house to relax in, WhatShed bring you the in depth reviews that have the answers to all your garden building questions. A lot of the wooden storage sheds that we review feature overlap cladding, which is a cost effective solution for both customer and manufacturer, but we are always pleased to see shiplap cladding used as in this good looking apex shed. The tongue and groove boards lock tightly together, meaning that there’s no way that water can enter into the shed, especially with the apex roof also carrying it away. We found high quality components throughout the shed, and it also represents reasonable value as it comes with a very reassuring 15 year guarantee. 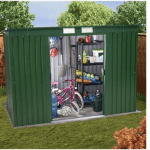 When these factors are added together it takes this Shed Republic model to the very top of our league table of the best wooden storage sheds. The reason that such a long warranty period can be given is that the manufacturer has used an initial pressure treatment to force wood preserver into the fibres of the substrate. It’s very effective and very long lasting. We were also impressed by the key operated lock that’s supplied as standard, which isn’t something that we often find on mid priced wooden storage sheds like this one. If you want a very durable, and very secure, storage solution for your garden, this is a great choice even if does cost a little more than some of its competitors. 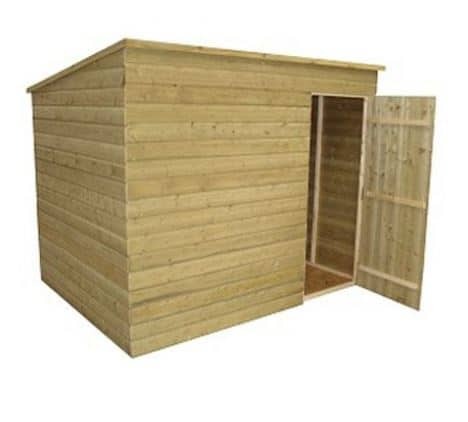 We now come to the highest placed of the wooden storage sheds that feature overlap cladding. Whilst this was lighter and thinner than the tongue and groove cladding that we often see, the shed as a whole still feels stable and reliable once it’s been assembled, and being lightweight it’s very quick and easy to install. This ease of installation is helped by the use of an onduline roof. This corrugated material is a modern alternative to traditional roofing felt, and yet it’s much easier to manoeuvre and therefore to install. This value adding feature was just one element that helped this great value shed into the runner up spot in our league table. We were very impressed that the timbers had been pressure treated to give them extra longevity and a first class defence against wet rot, as this isn’t something we would necessarily expect to see used on overlap cladding. This pressure treatment has also been used for the integrated floor bearers, which is very useful and much needed protection against the threat of ground moisture. At less than three hundred pounds for an eight by six timber shed with two fixed windows, this is also one of the best value wooden storage sheds that we’ve reviewed. We always like to see wooden storage sheds that offer exceptional value for money without compromising on the quality of components used, and it’s this winning combination that propels this BillyOh shed into the top three of our league table. 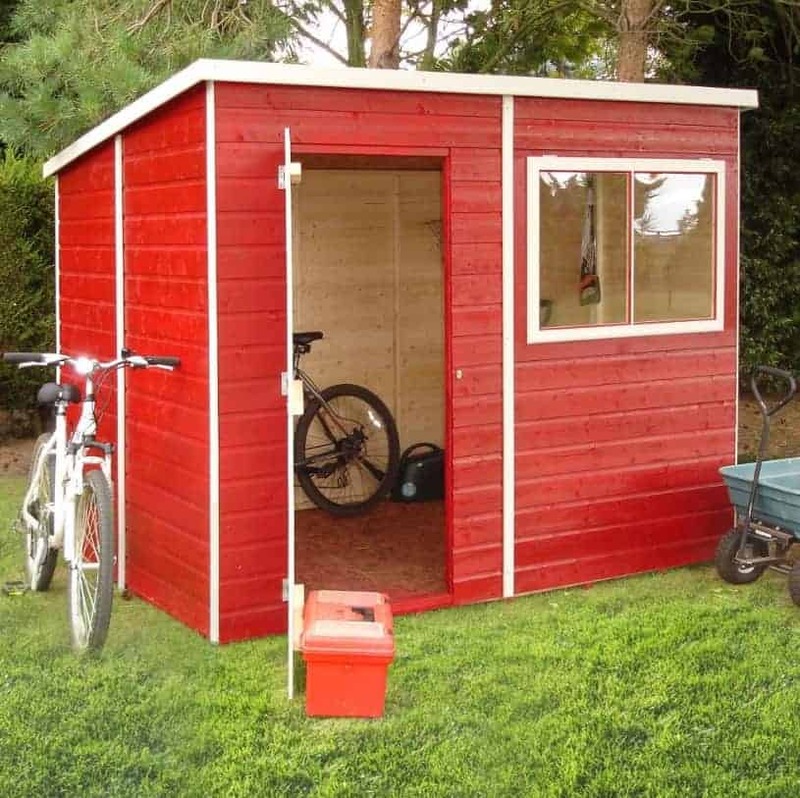 It’s not the largest storage shed that we’ve reviewed, with a base area of 2.02 x 2.39 but that’s still more than large enough to accept a standard lawnmower and a varied selection of garden tools, or even a bicycle or two. At a price of less than three hundred pounds it also won’t stretch the budget too much. One of the features that we found most useful about this shed is the use of security windows. This means that there are four tiny windows made out of shatter resistant styrene that are positioned just underneath the eaves of the roof. In this way a decent supply of natural light reaches the interior, which is always a good thing when storing or retrieving objects, and yet passers by will be unable to see if there’s anything valuable kept inside. We feel that this makes it much less likely to be targeted by opportune thieves who typically seek out easy targets, and it also comes with another reassuring feature in the shape of a 10 year guarantee against rot. From one of the least expensive wooden storage sheds in our list, we now come to the second most expensive. 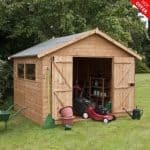 We realise that the price tag of over a thousand pounds for this Strongman shed may price some people out of buying it, and this has been taken into consideration when determining its position within our league table, but it certainly lives up to its name by being one of the strongest timber sheds that we’ve reviewed. 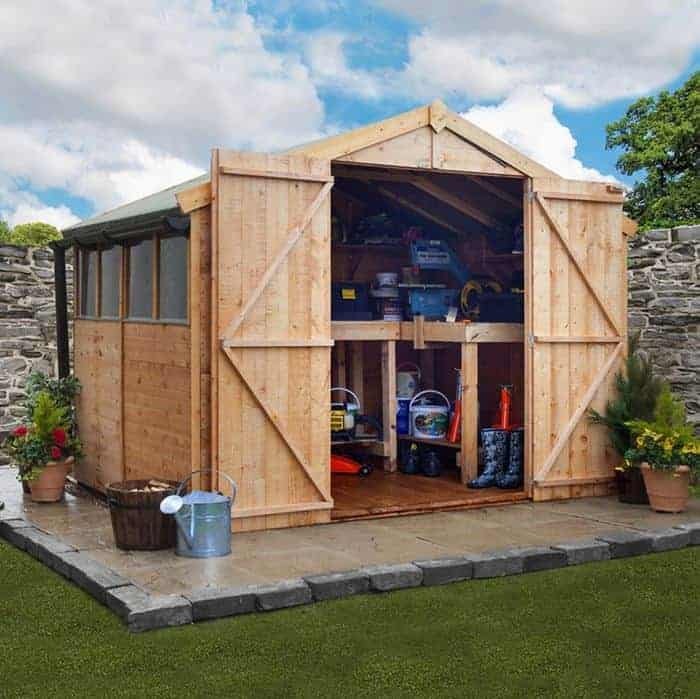 If this nine by six shed falls within your budget, then we would recommend that you move this to the very top of your shortlist when choosing a storage shed for your garden. Tongue and groove timber has been used throughout, but we were pleased to find that it was noticeably tougher than we’re used to seeing on the wooden storage sheds we review. In fact it’s 19mm thick, rather than the standard 12mm we often find used for shiplap sheds. The frame is also much thicker than average, at 44 x 58mm, so this creates a very strong and stable shed. We were also impressed at the use of Tanalith-E, a very high quality wood preserver, for the initial pressure treatment. It comes with a 15 year guarantee, but we wouldn’t be surprised to see it last even longer. 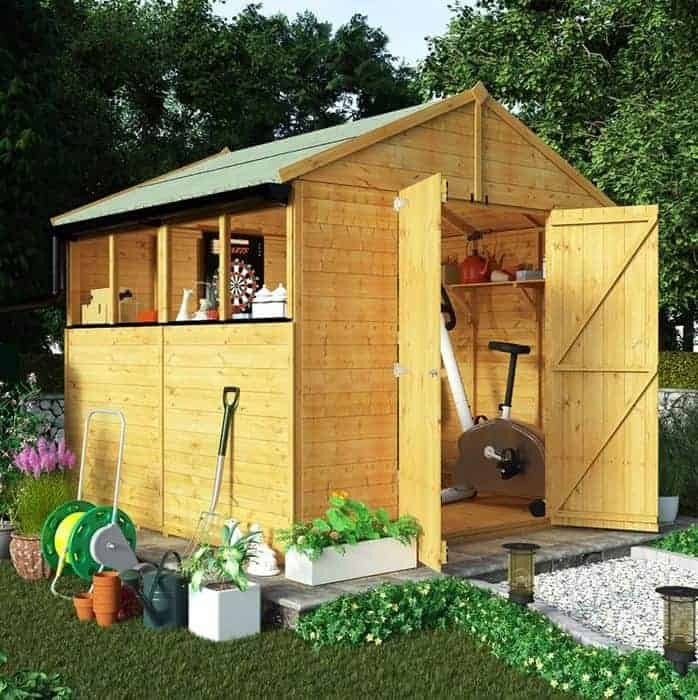 Wooden storage sheds can make gardening much easier and much more enjoyable, because all the tools and equipment you need can be stored close at hand. One thing that we liked most about this particular example is that it has wide and tall double hinged doors, so moving tall, wide, or bulky items in and out becomes simplicity itself. There’s also a well sized square window on the side panel that let’s light flood in on a sunny day, so this is an ideal shed for people who want to find what they’re looking for in a hurry. As it’s also very durable and available at a great value price, it earns a place in the top five of our league table. Once again we have overlap cladding, but this and the apex roof above it still do a good job of channeling water away. We were pleased to find that the roof was also a little taller than we often find on seven foot by five foot wooden storage sheds, and the six foot eaves mean that there’s plenty of room to walk about in. We were again glad to find that the timbers had been given a pressure treatment and that this brought with it a 15 year guarantee. If you want a low maintenance and low cost timber shed, this is certainly worthy of consideration. When people think of wooden storage sheds they are most likely to picture traditionally styled apex roofed sheds, but this has a very different design that brings significant advantage. With a base area of seven foot by seven foot, we feel that this corner shed is ideal for storage purposes, especially if a padlock is added to the handles that we were pleased to see were ready to accept one. Its five sided design means that it fits snugly into the corner of just about any garden, making it perfect for people who want the advantages that storage sheds can bring but are worried that they don’t have enough spare space in their garden to accommodate one. We were glad to see that the integrated floor joists have been pressure treated, as this is often where wooden storage sheds are most vulnerable to the moisture that can lead to rot, and the rest of the shed has been given a dipped basecoat. This brings with it a ten year guarantee, although that is dependent upon regular treatments being carried out. With two windows flanking the double doors we also found this to be a very attractive shed, and it’s only the slightly higher than average price which stops it being placed even further up this league table. 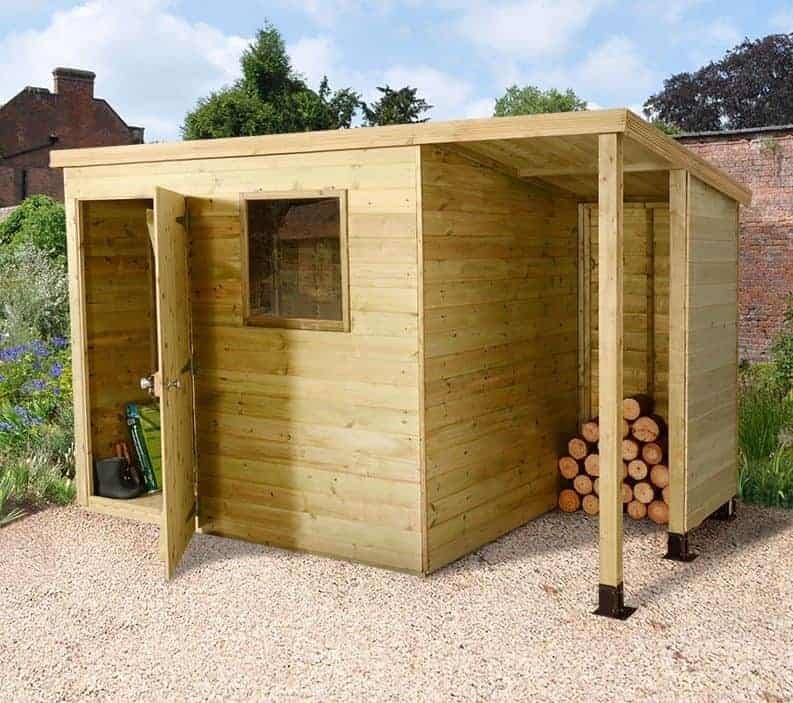 We always appreciate wooden storage sheds that have an attractive look of their very own, after all a shed is going to be one of the first things that catches the eye of anyone entering a garden, so form is almost as important as function. That’s certainly the case with this storage shed that borrows dramatically from the Dutch barn style. The most obvious indicator of this is the four sided staged roof, and whilst it still does a very good job of carrying rain and even snow away, it makes the shed as a whole much more exciting and aesthetically pleasing. This unique design does come at a price however, and it costs significantly more than many other eight foot by eight foot wooden storage sheds we’ve reviewed. Nevertheless we’re sure that many people will be happy to pay more to have a shed that also doubles as a garden feature in itself. 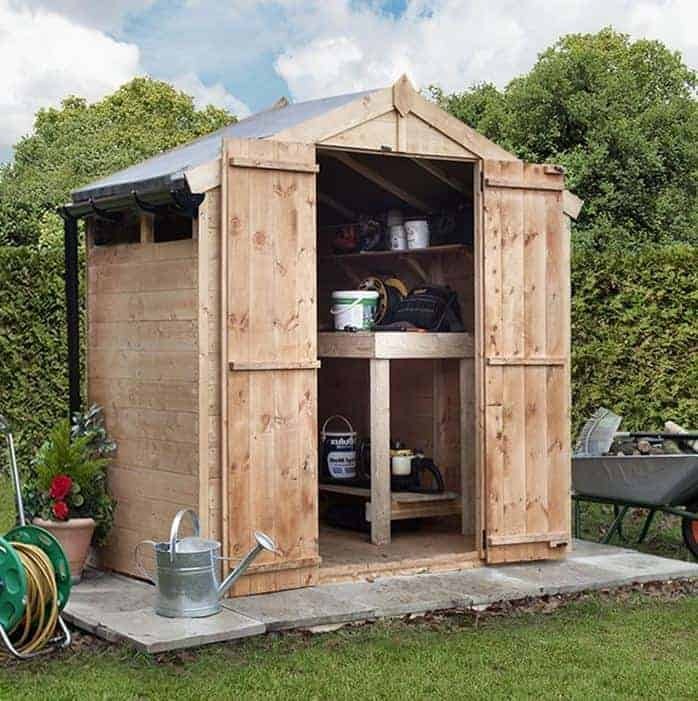 The peak height of 2.63m also makes it the tallest shed in this top twenty league table, so it’s ideal for those who are looking to store lots of tall items. With a ten year guarantee and a side window that opens to provide ventilation, this has a lot more to recommend it than just its good looks. This is the first of our top twenty wooden storage sheds to feature a pent rather than apex roof, and that not only brings a new look but new benefits as well. Whilst pent roofs often allow less head room than apex roofs, for example here we have an eaves height of 1.66m, this has a pitch that’s more pronounced than most so the front section of the shed is tall and accommodating at 2.07m. We also found it less obtrusive than a typical apex shed, so it should appeal to those who are looking for a subtle shed that will blend into the background rather than taking away from the beauty of the garden itself. We would have liked to see shiplap rather than overlap cladding of course, but its relatively compact footprint of 2.00 x 1.54m means that it still feels strong and stable once assembled. We were glad to see that an initial pressure treatment had been used, and to find that a 10 year warranty was provided by Shed-Plus. 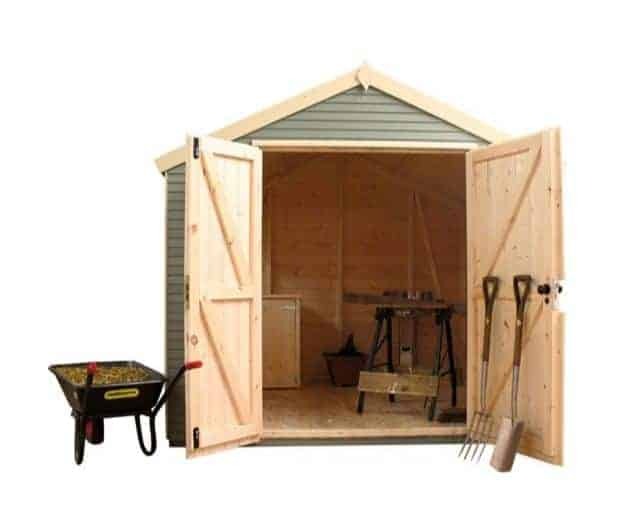 What we liked most of all about this shed, however, is the great value asking price of less than two hundred and fifty pounds, and it is this that has given it a place within the top half of our league table of the best wooden storage sheds that can be bought online today. Sometimes it’s the little things that can elevate fine, if perfectly average, wooden storage sheds to something that stands out from the crowd. In this case we were struck at first sight by the unusually shaped bargeboard at the front of the building, and this gives the shed the oriental feel alluded to in its title. 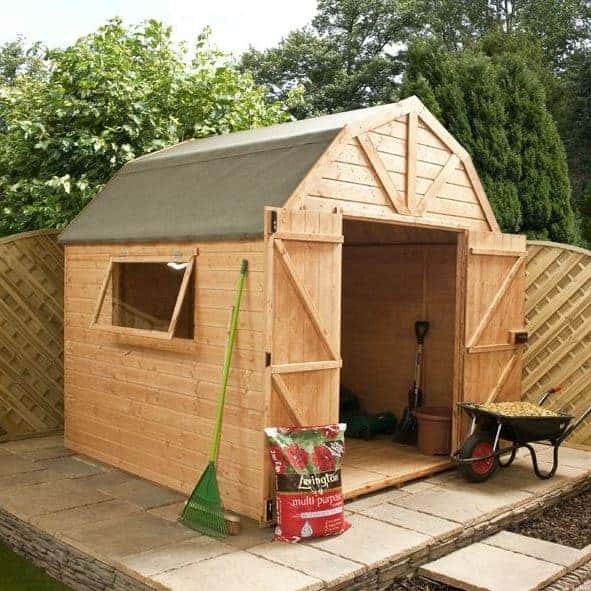 This can be further accentuated during the painting and staining stage, which is something we always recommend for bare wooden sheds, to create something that looks both unique and attractive. We were pleased to find that tongue and groove cladding had been used for the walls, so this should be strong enough even for windy and exposed gardens. Cheaper OSB material has been used for the wall and the floor, however, but this helps to create the good value price tag, and it was reassuring to find that the timbers as a whole were covered by a ten year guarantee. We also liked the bank of three windows along the side panel, which on a sunny day makes this one of the most illuminated interiors that we’ve seen on similarly sized wooden storage sheds. This then would make a good choice for somebody who likes the traditional look of a garden shed, but wants it to have an original twist that acts as a mark of quality. 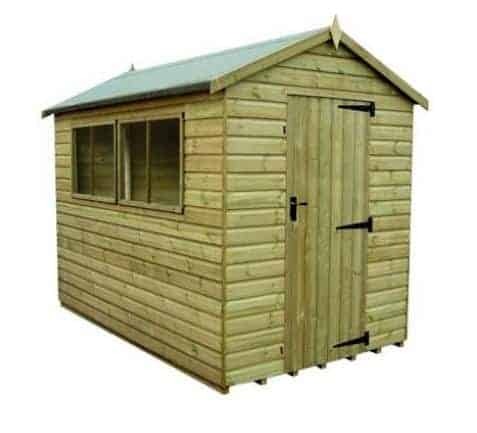 The majority of the twenty high quality wooden storage sheds that feature in this league table have an apex roof. This is perhaps unsurprising, as apex roofs are excellent at preventing rain from entering into the shed, and they often give more vertical space for storage purposes and for walking about in. This Windsor shed, however, gives the traditional apex roof a shift by offsetting it. 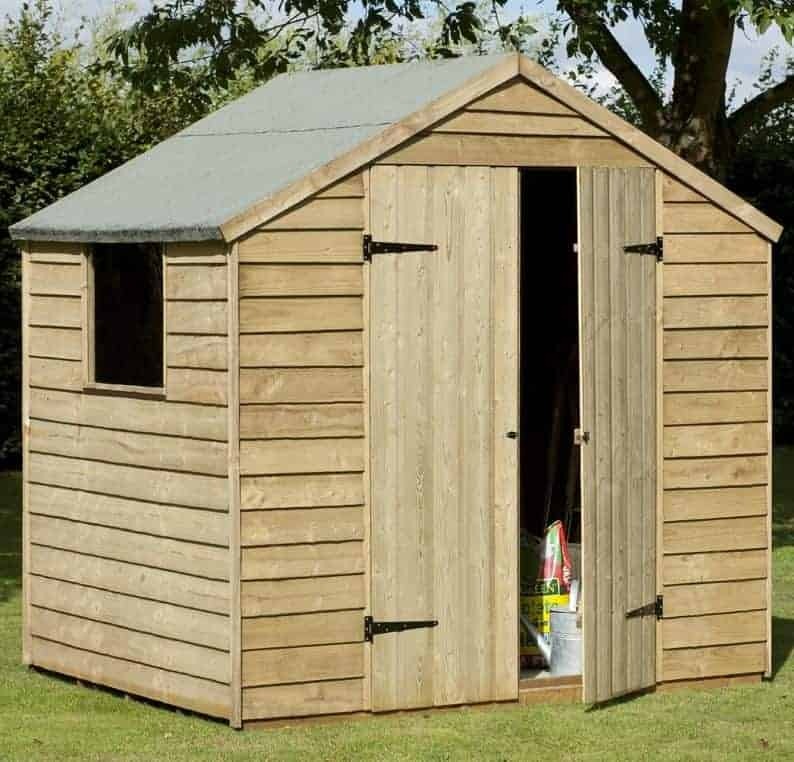 It’s still just as effective when it comes to its weather protection duties, but it makes it much more eye catching, which is why we found this one of the most attractive wooden storage sheds we’ve reviewed. 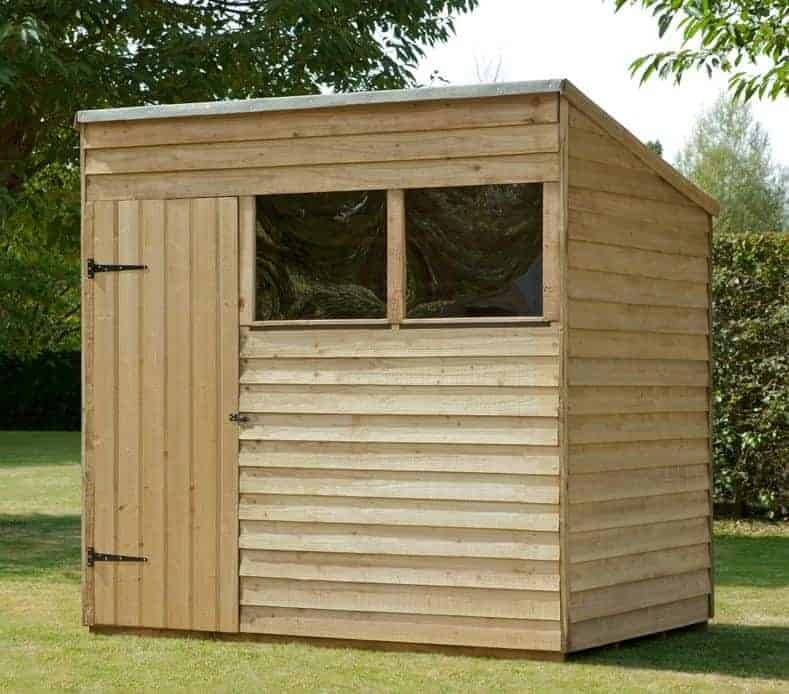 The overall dimensions of 2.08 x 2.06m means that there’s a lot of storage space available, and although the price of just over four hundred pounds is more than some seven foot wooden storage sheds we’ve reviewed, we still feel it represents reasonable value for money when its aesthetic appeal is taken into consideration. Tongue and groove cladding is used for the walls, which is something that we’re always glad to see, and even though it hasn’t been given a long lasting pressure treatment by the manufacturer, it still comes with a welcome and reassuring 10 year guarantee against wet rot. This pent roofed garden building earns its place in our list of the top twenty wooden storage sheds by providing added functionality and added value. Alongside the storage shed itself is an extra storage area, but this time specifically designed for logs and kindling. With increasing numbers of people switching to log burning stoves and fires, this is a feature that we really appreciated. The log store area is covered by the pent roof itself, so that rainwater runs harmlessly away, but it has an open front which allows for the ventilation that logs need in order to be in prime condition to be used as fuel. The main body of the building is the shed itself, but even this area holds advantages over many of the wooden storage sheds we review. One of these is that the one window at the front features toughened glass; it’s not something that we often see in a building of this size, and it makes it virtually shatter proof. We were also pleased to find that the tongue and groove cladding had been pressure treated and was therefore covered by a 15 year warranty. In fact, it’s only the asking price compared to the dimensions of the interior storage area that prevents this from being placed much higher up our league table. 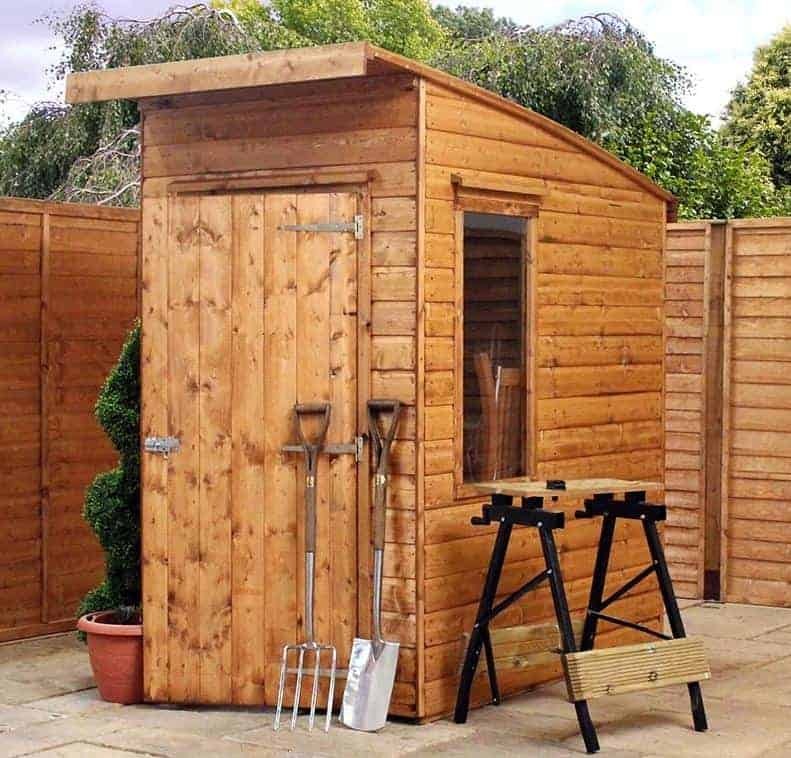 We often think that eight foot by six foot are the ideal dimensions for wooden storage sheds, as they allow for a large enough selection of tools and equipment to satisfy a small to medium sized garden without taking up too much precious lawn space. This space saving quality is further enhanced on this occasion by the use of a pent roof, which means that the shed could even be hidden out of sight behind a wall or fence to give it added security. We were glad to see that tightly interlock tongue and groove cladding had been used for all the surfaces, rather than cheaper materials being used for the roof and floor as we often see on the wooden storage sheds we review. This was continued with the braced single door as well, which is again made of tongue and groove and so feels strong and sturdy. There are two windows, and they feature glass rather than the more cost effective styrene. Once again, this was a sign of the high quality components that we found used throughout, and so if the treatment schedule is adhered to this should outlast its ten year warranty period and prove to be a very durable and good looking addition to any garden. Wooden storage sheds, by their very nature, often have valuable tools and equipment kept inside them, which can make them a target for opportune thieves. This pent roofed shed from Empire can be a cost effective solution if you plan on storing anything particularly valuable as it has no windows at all. This means that nobody but the owner will know if anything valuable is kept within, or if it’s practically empty. This can be a very effective deterrent, and we feel that the overall tough and no-nonsense appearance it creates could also deter some thieves from targeting it. With the addition of a padlock, which can be an inexpensive addition, this can be a security solution for your garden. We were very pleased to find that all of the timbers had been pressure treated, which means not only the tongue and groove cladding but the OSB roof and floor as well. On this occasion, however, it only brings with it a 10 year guarantee rather than the 15 year guarantee that we usually find applied to pressure treated wooden storage sheds. This, and an above average price for one of the smaller sheds in our league table, account for its position in the lower half of our list. When we review BillyOh wooden storage sheds we know that we are always going to find high quality components allied to an attractive design, and thankfully we weren’t disappointed with this Greenkeeper shed. The first thing that caught our attention was the height achieved by the apex roof, and reaching a peak of 2.35m it’s the tallest wooden shed in the BillyOh range. 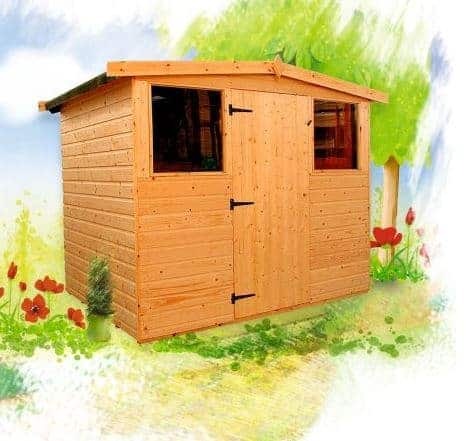 The base dimensions of 2.52 x 2.36m are also among the most generous of any shed in this league table, which makes this an ideal choice for those who have a lot of equipment to store, or even want to use their storage shed as a small scale workshop. There is a bank of windows across the full length of one side, which means that this becomes one of the most versatile wooden storage sheds that we’ve seen. With the addition of some furniture this could easily become a comfortable place to pass an hour or two in, and the wide opening double doors make it easy to move bulky items such as chairs in and out. There’s a ten year warranty that gives added value, but it’s also worth noting that in common with most other BillyOh sheds there is no floor supplied as standard, so that will take the asking price to over five hundred pounds. 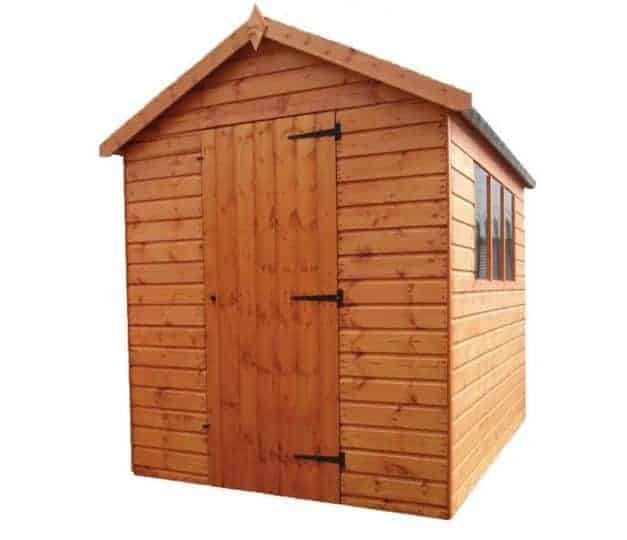 Here we have the second windowless building in our list of today’s best wooden storage sheds, but this has a much more traditional appearance thanks to its six foot by four foot dimensions and an apex roof. Once again this makes this a shed to consider for all those who may be keeping valuable equipment inside, or those who are storing tools that they may need for their job. We were glad to find that the single hinged door comes with a hasp and staple ready for a padlock to be added as a further boost to security, and the purchase of a lock needn’t add more than ten pounds to what is a very affordable asking price. 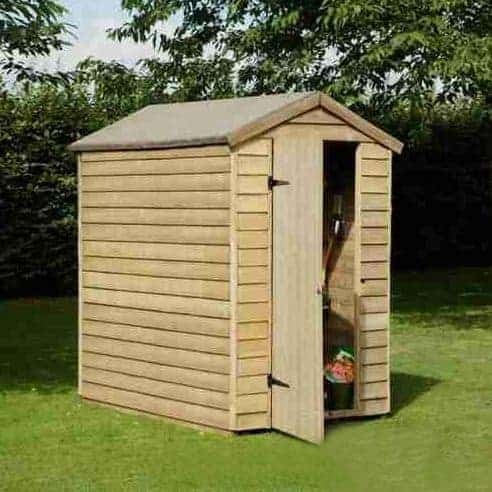 Indeed it’s this asking price of significantly less than two hundred pounds which makes this one of our top twenty wooden storage sheds. This is achieved largely through the use of money saving overlap cladding rather than the tougher tongue and groove cladding, and so under the circumstances we were pleased to find that a pressure treatment had been used on both the shed and its integral floor bearers. This brings with it a fifteen year warranty, making this a perfect but for people looking for a secure and durable six by four foot garden storage shed on a tight budget. We like wooden storage sheds that perform great and look great as well, and it’s an achievable combination as this Aero shed demonstrates. The manufacturer has taken the idea of the pent roof and taken it to a new level; instead of a straight pitch leading from front to back, this has a curved roof. It’s just as effective at causing rainwater to run away rather than being allowed to sit on the surface, but it creates a much more stylish appearance. We can imagine this shed going down particularly well with people who have modern homes and gardens, full of sleek lines and attractive curves. The roof overhangs at the front as well, creating a canopy effect and a shaded area on a hot, sunny day. One other design feature which is unique to this shed is that there are two long windows, one on each side. This creates a very well lit interior which we feel is perfectly suited to wooden storage sheds. 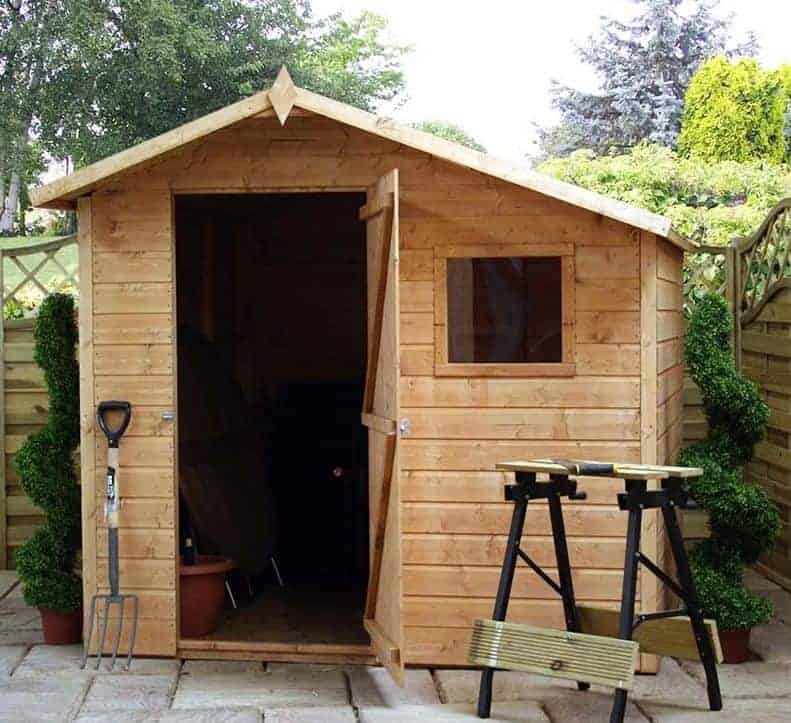 If you want a practical shed that has a unique look, then this is well worth considering even though it does cost more than many traditionally styled six foot by four foot sheds we’ve reviewed, and we would have liked to see the timbers pressure treated. This is the third from the BillyOh range of wooden storage sheds to make it into our top twenty league table, which shows what a high quality brand they are. Once again, however, there is no floor supplied as standard, meaning that the customer will have to pay an extra £67 for a solid sheet floor or £89 for a tough and sturdy tongue and groove floor. This is already proportionally the most expensive of the BillyOh sheds in this list, which accounts for its relative positioning compared to its stablemates. 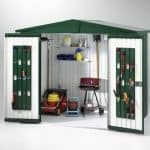 This does still have a lot going for it, however, compared to many of the wooden storage sheds that we’ve reviewed. One of these is that thick tongue and groove cladding has been used for the walls and the roof, creating a shed that feels very strong and stable once it’s been assembled. It also has a modular design, which makes it very quick to fit together, which can be a very useful feature for people who may find the idea of putting a six foot by ten foot shed together daunting. We also liked the wide opening double doors, so whatever you want to store, you’ll have no difficulty getting it in and out. This looks very different from the other apex roofed wooden storage sheds we’ve reviewed, and that’s because it has a reverse apex and a much shallower pitch to the roof than we usually see. It was the first thing we noticed about the shed and we found it very attractive, but it brings with it practical advantages as well. 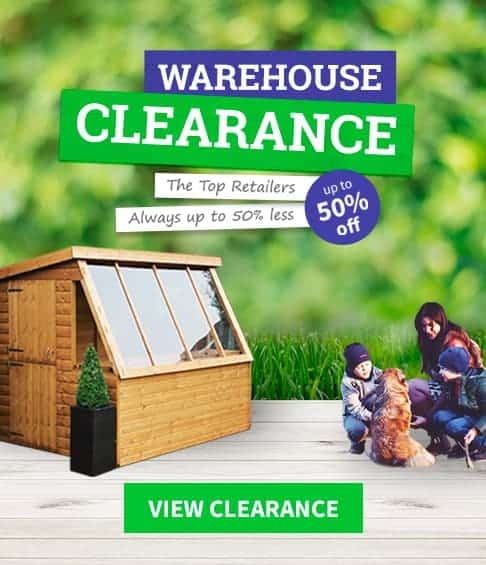 Firstly, being considerably wider than it is deep, with dimensions of 3.00m and 1.80m respectively, it’s perfect for those who are looking for a good sized storage facility but have a relatively shallow garden. Secondly, whilst the roof still carries rainwater away, it means that there’s not as much disparity between the ridge and eaves heights, so you won’t have to duck down too much when moving around inside. The centrally positioned single door has a square window on either side of it, and we were pleased to see that it also features a secure key operated lock. With shed crime on everyone’s mind, we’re surprised that more wooden storage sheds don’t include this value adding feature. We were also glad to see that the tongue and groove cladding has been pressure treated, but on this occasion that doesn’t bring any extended warranty with it as we would have expected. It’s this omission that prevents this otherwise excellent shed from achieving a higher position in our league table. 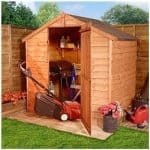 This is an eight foot by eight foot building that ticks a lot of the right boxes when it comes to wooden storage sheds. For starters, we were glad to find that it features a full tongue and groove construction, thus resisting the temptation to use cheaper materials for the floor and the roof. 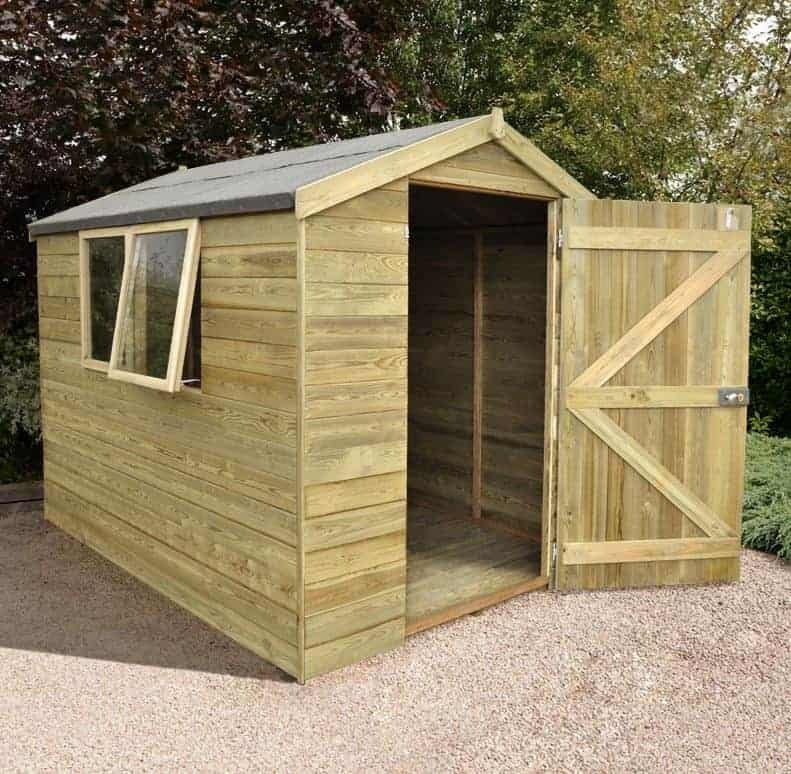 The smooth planed effect that this creates makes this a striking garden shed that we feel will particularly appeal to those who love traditional styling. There are three windows, but what we liked most about them is that the panels are interchangeable so that they can be positioned on either side. 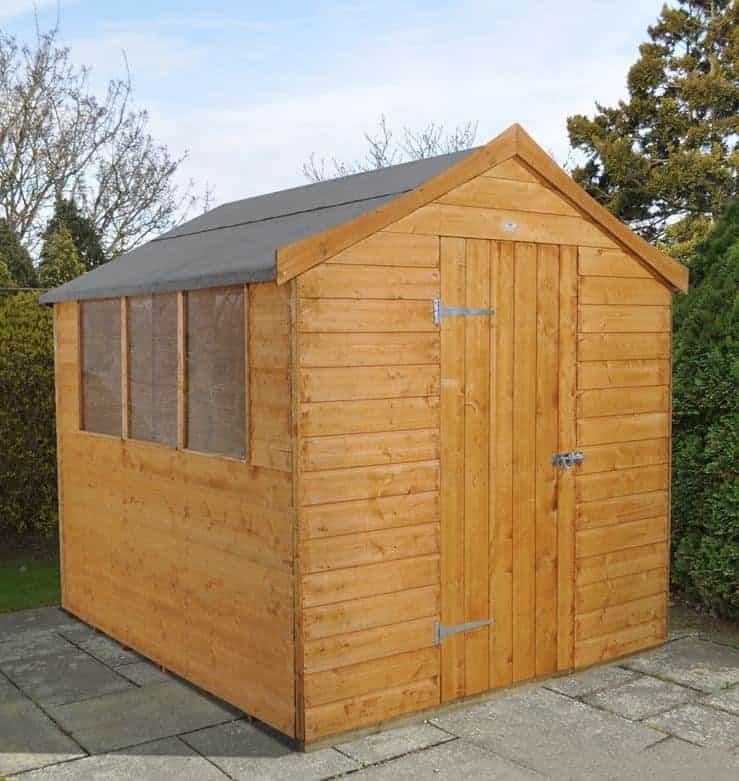 This, in fact, is a shed that comes with lots of options, which is something we always welcome in wooden storage sheds as it allows the customer to get one that’s perfectly suited to their garden. The standard 12mm shiplap cladding can be upgraded to 18mm shiplap, 15mm loglap, or 15mm tanalised cladding. Heavy duty framing and flooring can be added, and the fixed windows can be changed for opening ones. All of these options can add significantly to the asking price, of course. This is already higher than we find on most similarly sized sheds, and as there’s no preservative treatment on the standard model, this keeps it towards the foot of our league table. These wooden storage sheds make the bold claim of being the ultimate sheds, and in terms of toughness and durability they may have a point. From the moment we first saw this building we knew that it was made to the highest quality, and we were pleased to find this confirmed upon further investigation. One example of this is the use of 16mm tongue and groove cladding for the walls, roof and floor, making it stronger and more stable than nearly all of its competitors. It was also noticeable that glass had been used for the two windows, rather than the cheaper plastic glazing that we often find used on wooden storage sheds. This does mean, however, that you will have to be careful around the windows especially if you often have young children playing in the area. We were glad to see that the shed is not only a tough environment it’s also a secure one, with a rim lock included as standard. It has to be said, however, that this is also by far the most expensive of the wooden storage sheds in our league table, and with a 10 rather than 15 year warranty as well, this prevents it from being placed any higher up our WhatShed league table, as it would otherwise have been.